2 door fibre wall box and wall mounted cabinet / enclosure for fibre optic cable termination. Products include a lockable 2 door fibre wall box for housing optical fibre. 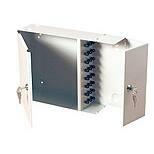 Each unit is supplied loaded with 6, 12 or 24 port SC or ST plates and adaptors as required. 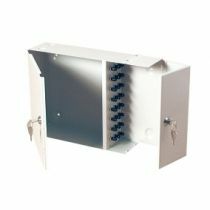 Our fiber wall mounted cabinets include splice management.